Omotesando Hills is not short of breakfast places and one of them is Afternoon Tea-Tea Stand. While this is under the umbrella group of Afternoon Tea, the quality of food here is significantly better than the mediocre "brunch" fare at its sister restaurant, Afternoon Tea Sunday Brunch, and it opens as early as 9am. Best of all, a page of the menu is dedicated to "Bakers' French Toast", something that I love to have for breakfast rather than pancakes. Gone are the days when hampers are typically filled with Ferrero Rochers or cans of dried cuttlefish crackers. They now come all in sorts of fashion and style, suited for any occasion that calls for celebration. If you are looking for a unique, extraordinary hamper that will definitely bring a smile to your recipient, leave the task to the gift professionals at Gift Hampers, a company whose philosophy is to find unique products that are cannot find elsewhere in Singapore with the aim of bringing customers a collection of extraordinary products that impresses. Finally, the fetish that I've been waiting for. Not 1 item on the menu, but a magical number of 22. An auspicious figure because it is not only my birthday date, but also the number of items that contains the sacred green ingredient that has soared to popularity over the last few years. For those who are familiar with Pierre Herme's fetish, this might be another "copycat" idea but like the debate on the originality of art, who is to judge if one is less original than the other? On this point, I think Chef Pang has gained a first mover advantage by coming up with Fetish Matcha, an idea itself so dangerously attractive and would easily outdo the popularity of any Fetish Celeste, Fetish Montebello, Fetish Mogador etc. Sorry Monsieur Pierre Herme, I think you've got some work to catch up. From the classics items like petit fours or a matcha strawberry shortcake to the trendy matcha lava croissant or Instagram-worthy cotton candy matcha latte, this matcha all-stars summit is a true test of how much you love (or hate) matcha. You might love matcha at first and walk away not wanting to see matcha for the rest of the week or month. Or you may be enemies with matcha initially and end up being it's best ally. To conquer all 22 items is not easy, and even more so to create it. In this regards, I say hats off to Chef Pang who has the guts to make a foray into this tricky theme. For a start, matcha is not an easy, straightforward ingredient to work with. Very often, I get matcha desserts that are drowned by sugar or other dominating flavors and most certainly not every matcha item in this Fetish menu is born equal. But one thing for sure is that you won't find the usual accomplices like red bean, black sugar, kinako or black beans. On the contrary, I see a more French approach, not in terms of the repertoire like Millefeuille, St Honore or Choux. It was the pairing matcha with marrons (chestnuts) which added sparkle to the mellow flavors. For instance, you get marron chantily cream in the matcha pancakes, marron paste within the matcha crepes or candied marrons ambushed inside the heart-shaped matcha gateau cake. In fact, I was impressed at the way chestnuts were handled here because their notorious sweetness can easily overpower the dish. But here, they were like delicate whiffs of clouds that made a fleeting appearance. Very light yet pleasurable. Made with Matcha from Nishio, the place where tea cultivation in Japan first started, some are more intense than the other, some look less "matcha" than the others. So don't expect everything to be knock-off-your-socks 100% matcha in taste. In fact, that's a good thing because it prevents a strong repulsion or keep the "jelat" feeling at bay. Nonetheless, I would be lying if I say that I like every single dish out of the 22. But on the other hand, you would be reading a 5-million word thesis if I were to dwell into every detail of the memorable dishes. I enjoyed the "Yucha", a simple sugarless kirsh-infused matcha butter cake and matcha Creme mousseline, for its clean taste, the Magnum Matcha Cake Pop for its crunchy texture and the Matcha Lava Croissant which boasted the superbly flaky yet stretchy structure with a confident flow of viscous matcha chocolate lava. The icy sweet beverages such as matcha soda, matcha yuzu or matcha lychee are undeniably refreshing on a hot day but I thought a pot of pure matcha brew was what I needed most to balance the sugar. Another dish which I cannot afford to miss out here is the Matcha Pasta. Cooked with morello mushrooms, Sakura Ebi, salted konbu and truffle paste, the matcha "Mee Pok" is a carefully composed plate that offered delectably chewy bites with a nice umami kick. The matcha emerged more as an aftertaste but it didn't quite matter. I was craving for another plate mid-way through the meal. I call this a dessert revolution, one that has raised the standards of desserts in Singapore to another level. It's truly hard to describe the experience of undergoing the entire course for someone like me who is partial towards matcha. I was truly excited at first but my stomach space gradually filled up and I couldn't appreciate the items as much as I wanted. That's when I realized my "fetish" was put to a test but I didn't regret at all. It's a rewarding journey that made me understand the tea better and I look forward to the next fetish to come. While they are available as ala carte items, you can gather your comrades to enjoy all 22 items (including 3 different kinds of matcha beverage concoctions) at $190 (less than $50 per head) from now till end July. For most of the creations in the Fetish series, $1 per order sold will be donated to the Singapore Children's Society OCBC-TODAY Children's Fund. Are you up for the fetish challenge? If you had plenty of carrot cake before, how about having png kueh (rice cake) or soon kueh (turnip cake) pan-fried into carrot cake style? Pan-fried png kueh are usually done at home where the kuehs are seared to a nice caramelized brown tone, imbuing the chewy glutinous skin an extra crispness. Hence, it quite an eye-opener to discover this delicacy in Bendemeer Hawker Center. Our choice of pan-fried Png Kueh and Soon kueh looked like a mess but it was tasty even without the black sauce. The uncle used a lot of oil to fry and thus be prepared to handle some greasiness here. However, the frying process did give a slippery feel the soon kueh which glides smoothly across the tongue. Be it this unique fried kueh or the white carrot cake, it was very generous with the eggs and perhaps a little more chye por would make this even more fragrant. For those who are looking for the premium, authentic Matcha and Houjicha powder straight from Japan without going to any local suppliers here, Grace and Green is the ideal online platform where you can order your products and have them delivered right to your doorstep. This Chiba-based Japanese start-up was established in 2015 by Ritsuko Takahashi san, who wanted to educate more people and bring the finest quality of Japanese tea powder to the masses. She sourced the matcha from Marukyu-Koyamaen, a highly renowned Kyoto tea producer which has won the top position in All Japan tea contest nineteen times. There are basically 4 types of matcha available at Grace and Green. Ceremonial Matcha is the highest grade and most flavorful tea that is best suited for special occasions, usually tea ceremonies, and for those who are familiar with the fundamentals of making a good matcha brew. Not just stirring them in hot water. The Luxury matcha is the organic tea powder that is good for everyday consumption. The Healthy Green Tea Powder (SGD19.35 /40g) in black packaging is the most affordable pack. And if you use them more in baking/cooking like me, the Regular Matcha (SGD29/40g) will fit the bill. However, don't mistake this for the usual cooking grade matcha just because of the word "regular" as this is not. Those in supermarkets or baking stores are relatively cheaper but they are often the powder of low grade of sencha. It is difficult to judge by just staring at the display shelves but I usually check by the source and the price per gram since we can't possibly open the goods and examine every single product. Very often for the case of matcha, you pay for what you get just like the chinese old saying, 一分钱一分货。Once you open the tin, you can straight away tell the difference between this and those sold from baking shops or supermarkets. The colour is a fresh vibrant green and the taste is medium-bodied without any hints of grassiness. For instance, the tiramisu cake above is dusted with Grace & Green's matcha but the sponge is made with normal supermarket matcha brand. The difference is very obvious. I have often been asked which is my favourite, Matcha or Houjicha? I really don't have an answer as I crave for Houjicha more than matcha on some days. Houjicha (SGD11.75/30g) gives out extremely pleasant whiffs of milk tea naturally even though no sugar was added in the first place. The aroma is much more intense than matcha, with a long-lasting smoothness that rounds the palate. Another hot-selling items is the Yuzu Citrus Powder (SGD10/30g). It is light yellowish color and is neither acidic nor sourish, contrary to common perceptions. In fact, it has a mild bitterness like pomelo. G&G's yuzu powder is made from the peel section of organic yuzu fruits and added with dextrin, a processed food starch, to maintain the aroma and freshness of the powder. Otherwise, it tends to turn stale as the essential oils will gradually dissipates after coming into contact with air. When I tried to use the powder to make a light yuzu chantily cream for my honey sponge roll, they did not give me any problems at all; they are highly soluble without forming any clumps. You can also control the sweetness by adding the amount of sugar to your liking since this is not sweet in the first place. All deliveries will come with a delivery tracking code and the delivery process was reguarly updated via emails. In other words, the transaction was pretty safe and secure as I was informed when the goods left Japan's post office and reach Singapore. International delivery via EMS option is chargeable at USD5 but it is free for orders above USD36. I am not a tea expert but still, I highly recommend this as I have been experimenting with different brands of Japanese matcha powder in my bakes and the products from Grace & Green really yields excellent results. One thing which I appreciate about Grace & Green is the detailed description given to each product and a step-by-step guide to help customers identify the best kind that caters to their needs. This is especially helpful for non-frequent online shoppers as it reduces the uncertainty and reassures that I am getting the most value from my purchases. This is definitely a good brand to invest in for those who is looking to create not Japanese -style desserts but also for cooking in savoury dishes. There are many popular stalls at Hong Lim Food Centre such as Outram Road Char Kway Teow or Heng Kee Curry Chicken Bee Hoon Mee but I think Cantonese Delights is the one with the consistently longest queue. This place has been on my to-try list for very long but I was always deterred by the long queues. It was through Calvin (@entree kibbles) where I first learnt about this stall. Subsequently, I chanced upon an earlier article by Dr. Leslie Tay about its Fried Chicken Curry Noodles which made me even hungrier and eager to try the food. However, lady luck was not with me when I decided to queue as the stall was closed. Still, I was determined to visit again and this time, I was lucky to catch it open even though it was a 30-min long wait during weekday peak lunch hour. Fetish : An excessive and irrational devotion or commitment to a particular thing. I always find that "Fetish" is a very good word to describe the seasonally-rotating theme desserts from Pierre Herme. As briefly described before, "Fetish" plays around with a certain flavour combination, for instance Fetish Morebello was pistachio and raspberries (luckily not Cherries). Indian cuisine is definitely more than just Roti Prata and Curry. As a person who grows up with Bollywood movies and briyanis, palek paneer, butter chicken and mango lassi for my family dine-out, I was excited to learn about the Flavors of India buffet. 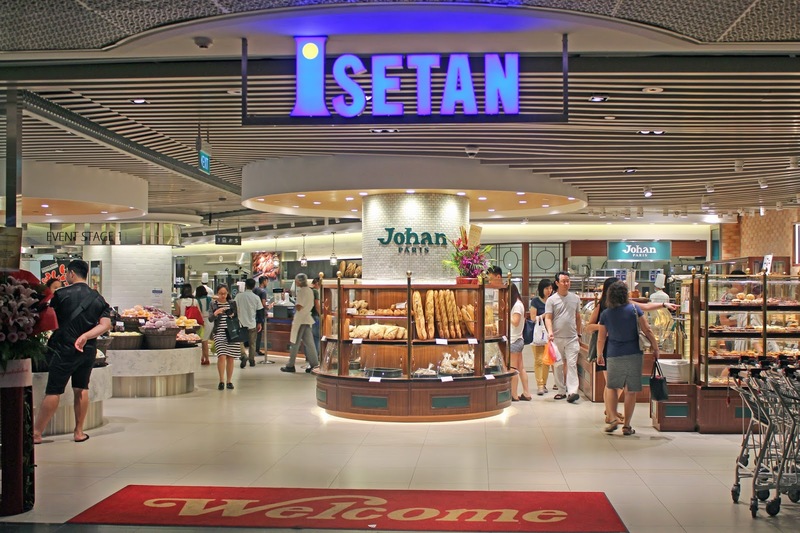 Finally, the day has come when Isetan Scotts Supermarket fully reopens after months of renovation. Besides the three new additions (Johan Paris, Matsuzo Potato and Chateraise) mentioned in the previous post, the grocery section has now been completely makeover and elevates the shopping experience to a whole new level. In fact, the supermarket has hired top design companies from Tokyo, NONSCALE and SEMBA, to transform the space into one that exudes clean design aesthetics and the vibe of a luxury kitchen. As I walked around, I noticed that there is not only wider walkways but also brighter, natural lightings with a clear organization and display of products. In addition, there is now a centralized area dedicated to seasonal and regional food fairs like Kyushu Food Fair or Okayama food fair whereas in the past when temporary pop-up booths are located in many pockets of the basement market. . The new Food Theatre Concept offers a multi sensory shopping experience to shoppers and reinforces its leading position in Singapore as a place that delivers Japanese produce and cooked food of the freshest and superior quality. Situated on the 33rd floor of The Westin Singapore, Cook & Brew is devoted to serving classic pub food and modern renditions of European fare, of which some of done with a local twist. From the beginning of May, it has launched a highly attractive 2-set lunch and 3-set dinner menu which is great for business dining or special occasions especially when it comes with the exhilarating view of the Marina Bay skyline. Some of the highlights from the starters include this Heirloom Tomatoes and Plums, which tasted like a very light and sweet fruit salad. The buttermilk and gorgozonla cheese dressing was very subtle and did not overpower the natural umami of tomatoes. I thought the addition of sweet and crunchy pecan brittle was a very clever move as it enhanced both the texture and flavor. My jaws dropped wide open when I read that the gourmet burgers from the hippest London burger joint, Meatliquor SIN, will be going for $7 instead of the usual $20+ during lunch. This is even more affordable than an $8 Donburi from Lau Pa Sat and the same as the cheapest salad in CBD area. To celebrate MeatliquorSIN's lunch opening every single day of the week, the burgers are going at $7 for 7days during lunch starting 16 May to 22 May (next Mon-Sun). This means that even if you can't run to Meatliquor Sin during weekdays, you can still do it during weekends. This is the golden opportunity to make a trip down because the burgers can cost up to $24. Very often, we travel all over the sunny island or fly overseas in search of the most delicious food in the world without realizing that the tastiest ones lie in our own backyard. HK Street Chun Kee @ Blk 151 AMK is simply a 10-minutes walk away from my house but I have never visited this outlet after since the branch at Upp. Thomson Road closed down. I've only remember it for its San Lou Hor Fun but my mum and aunties are loyal customers of their Fish Head Bee Hoon Soup. Finally, we decided to hop over here for a simple Mother's Day lunch instead of patronizing any Chinese restaurants or other zichar stall. It feels good to come back to Bukit Timah after so long for an old girls catch up. But the scene has changed here with so many new F&B outlets, one of which is Atlas Coffeehouse that is opened by the same duo behind the now defunct Assembly Coffee. There are those standard type of waffles which you eat with ice cream or copious amount of whipped cream and fruits in cafes and restaurants. Then there’s the Liège waffle. This is the people’s waffle, the waffle that’s sold for less than 200 yen on the street and warmly wrapped in a slip of waxy paper to eat on the go. Besides Mr.Waffles in Shinjuku, my next favourite waffle place-to-go is this German franchise that has many outlets in Japan. Finally checked out this hipsterish food court which felt like a backstreet garage with neon red lightings and liberal graffiti wall prints. The price and type of food sold here (mainly burgers, sandwiches, rice bowls, meats) reminded me of gourmet food trucks that are based permanently in a location. Another new bread shop? Yes, but this shop does not sell French baguettes nor any artisan breads. It sells Chinese steamed baos aka mantous, done with a creative twist. After dinner at Suntec with the family, I walked past a newly opened shop that caught my attention for its colorful baos that are made with natural ingredients and no artificial coloring. Besides buns, the cafe also sells soups and sliced cakes. The shop looked like it just opened for a few days as there were many congratulatory bouquets around the shop. After sampling the Yam bun given by the friendly staff, we decided to pick more to try for breakfast. 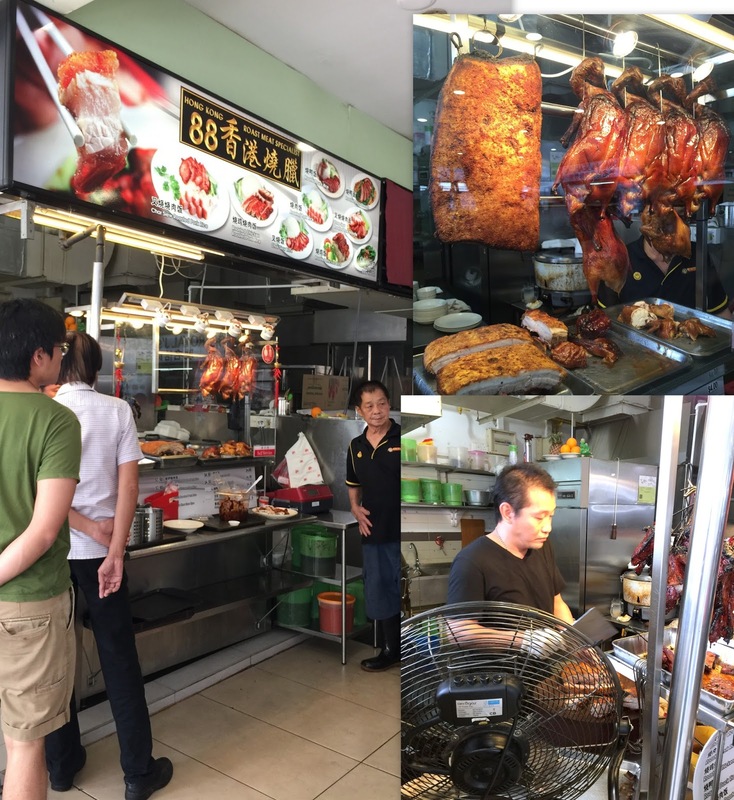 Thanks to the recommendation by Derrick, I finally made my way down to Foch Road not for Kok Kee Wanton Mee or Pig Organ Soup, but to taste what some people name as the "best roasted meat" in town.